Many home DIY (do-it-yourself) enthusiasts can’t wait to pick up a roller or brush and something with color and we don’t blame you! 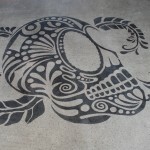 Color is the part about our job we love the most, but when it comes to something permanent like concrete stain, knowing the pros and cons of DIY concrete stain vs. the application of concrete stains by professional concrete contractors will save you a lot of heartache. 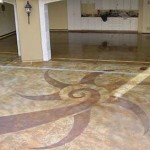 To start with, there are two categories of concrete stain: acid stain and water-based stain. Most home DIY stores are going to sell you the water-based variety which will fill the pores of the concrete and coat it rather than react and penetrate it. 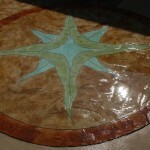 Most pictures you see online with the translucent and mottled look are done with an acid stain which chemically reacts to the concrete and multiple colors can be used to achieve the faux stone, wood grain, leather, or marble look. We would never recommend someone without the proper training work with an acid formula and much rather you call up a professional concrete contractor for something like this. 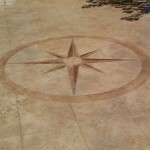 When planning a concrete stain project, there is also a lot of prep work to think about. 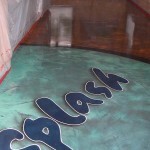 As we mentioned before, the water-based stain is something that is closer to paint because it fills-in the pores of the concrete. If the concrete was not properly prepared for the stain and was harboring dust and debris before the application, there could be chipping or flaking of your stain in the future. 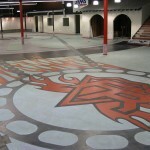 Professional concrete contractors will use professional-grade equipment to prepare the concrete flooring inside or outside of your home, office, restaurant, or other business and ensure it is ready (this may include grinding down a weaker layer of concrete paste from the surface to reveal the stronger concrete layer underneath and polish it for industrial applications to prevent future cracking). 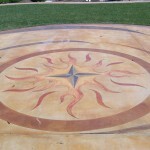 Once an acid stain is applied, it chemically bonds to the concrete itself and will not flake any product. After that, it can be sealed and waxed for extra shine, preservation of color, and ease of cleaning (a simple dust mop will work for daily cleaning which is so much easier than most flooring materials!). A home DIY-er is not going to have access to the heavy concrete grinders and polishers used to thoroughly prepare a floor for a proper staining that will ensure this future easy-up-keep outcome. 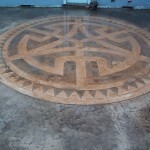 Simple textures with acid stain give dimension and class to your concrete, transforming your home or businesses from the floor, up. 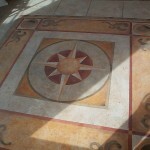 Visit our gallery for other samples and then call us to schedule a consultation. 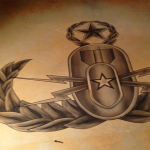 We would love to look at pictures with your ideas and talk about colors with you. 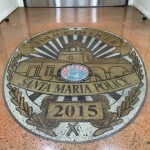 We work with home owners and business owners for commercial and industrial projects between Santa Barbara and Monterey on the central coast of California.